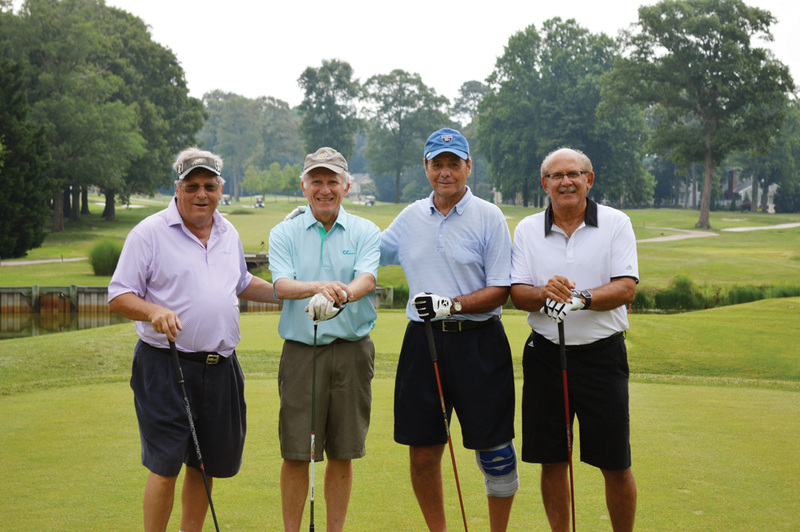 Members Tom Spink, Frank Soboyna, Vin Schettino and Leo Renzette get ready to tee off on the new hole No. 9 at Cripple Creek Golf & Country Club. The course received a major facelift to provide further opportunities for the club’s golfing members to work on their game. To make the opportunity come to life, the CC minds had to devise a plan where they would essentially flip the course, moving the front nine to the back and vice versa. The 9th green became the 18th, and 18th became the 9th. That was just the start of the plan. Next, they had to shorten the Par 5 hole to a Par 4, and reconstruct a new putting green for the hole to be complete. The shortened distance provided the necessary land space for the expanded practice facility to begin. Last week, members were out and about, enjoying the new hole just before a storm rolled through. Cripple Creek member Tom Spink had just hit a tremendous tee-shot right down the middle of the fairway on No. 9, and before moving on had some positive words on the new course and practice facility design. Spink was joined in his foursome by fellow Bay Colony resident Vin Schettino, as well as Frank Sobonya, a resident of Sea Colony near Bethany Beach, and Cripple Creek resident Leo Renzette, who lives right at the 17th green. The course is now a balanced Par 72, with both the front and back nines equally shooting at a Par 36. The new 9th hole measures 378 yards from the white tee box. The concept for Cripple Creek began way back in July of 1982 with Donald Wilgus. It was then that Wilgus contacted course architect Algie M. Pulley to give his opinion on the cost and possibilities of creating a golf community near the waters of the Indian River Bay. Ground for the front nine was broken in June of 1983, and just over one year later, in July 1984, the front nine was opened for its 48 original charter members. At that time, the back nine was under construction, though it would not be ready until Memorial Day weekend in 1986. For more information on the new practice facility or for membership information, check out the course’s website at www.cripplecreekgolf.org. They can also be found on Facebook at facebook.com/CrippleCreekGolfAndCountryClub.